Nose: Initially there's peat smoke on the nose complemented by lots of delicate sweetness of barley sugar. Vanilla's coming through with mint, toffee and a pleasant citric note. Fruity aromas of peach and pear intermingle with intense notes of barley and a whiff of iodine in the back. Palate: Bold and intense on the palate but smooth at the same time. Lots of vanilla sweetness, mixed with toffee and crème brûlée. Then flavours of tar and coal arrive complemented by hot spices - cloves, cracked black pepper, wrapped in gentle peat smoke. Soft fruits and citric notes linger with a mix of sea spray and leather towards the finish. Pleasantly mouthfilling. Finish: The finish is long with sweet notes of vanilla, peat fire and tender smoke. Sweetness of fudge fades bringing subtle nutty flavours and tender briny tones to the fore. With water: Fresher on the nose. 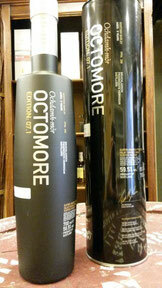 Water enhances the citric notes while taming the peat smoke and ashy aroma. Very sweet on the palate with intense notes of vanilla, toffee and crème brûlée. The spiciness is a bit tamed with water. Creamy, chewy with lemon, almonds and salty flavours. The finish is long, sweet and pleasantly creamy with a whiff of peat and subtle smouldering wood on the tail. Comments: Surprisingly sweet and nicely palatable despite the high alcoholic strength. The high level of 208 ppm is scarcely noticeable. However, a little bit disappointing to me as it is rather one-dimensional without any significant highlights. Maybe this is owing to its youth. Water brings out an intense and rather unexpected creamy sweetness. It really isn't a beast. I thank the Scottsman Harry Hammelmann for the sample!